This view of Bamburgh Castle in Northumberland illustrates verses from an 1866 edition of Sir Walter Scott’s long narrative poem ‘Marmion’. They describe the journey by boat of the Abbess of Whitby and four of her nuns, including the poem’s heroine Clara de Clare, to Lindisfarne Priory on Holy Island. On its way along the Northumbrian coast the boat passes the majestic castle of Bamburgh, an immensely strong fortress which stands in a spectacular setting on a basalt outcrop on the edge of the North Sea. The existing structure was begun by the Normans in the mid-12th century but the site has a more ancient history. Scott refers to King Ida, who conquered Northumberland in the 6th century, and made Bamburgh the capital of the Anglo-Saxon kingdom Bernicia. From the castle ramparts there are fine views of the Farne Islands to the east and Holy Island to the north. Sir Walter Scott (1771-1832) was the Scottish author of immensely popular historical novels and poems. Their epic combination of history, chivalry and romance was especially beloved by readers of the Victorian era. ‘Marmion: A Tale of Flodden Field’, first published in 1808, tells the story of the noble but arrogant Lord Marmion, a fictional 16th-century English knight in the time of Henry VIII, and the fate of his two loves Clara de Clare and Constance Beverley. The story is intertwined with the antagonism between England and Scotland under the rule of James IV. When Henry VIII attempted to invade France, James declared war on England and led an invading army south. The poem takes its title and inspiration from the Battle of Flodden Field in Northumberland in 1513, at which James was defeated and killed with many of his Scottish nobles and thousands of his feudal army. 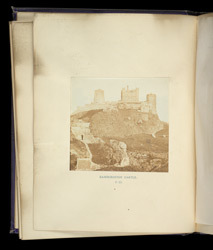 This edition of the poem is illustrated with 15 photographs by the Glasgow-based photographer Thomas Annan of sites in Northumberland and Scotland which feature in the poem.